So I recently purchased a classic Xbox game (which ended up sucking, more on that later) on Ebay and while the transaction went perfectly smooth, I noticed a small glitch in their post-purchase ‘leave feedback’ follow up. It’s been almost 5 weeks since the auction ended and while I paid immediately and received the game quickly, I was being lazy and hadn’t left feedback for the buyer (feedback is an Ebay tradition since inception and a ‘good citizen’ thing to do). Conveniently, in my inbox was an email from Ebay asking me to leave feedback with a handy link to my auction page. Here’s the page I saw after I had to login. See if you can find the ‘leave feedback’ link. Hint: I made it easy, the link is purple. Not so easy huh? My main problem is that this closed auction page which belongs only to the seller and I, should have a very clear call to action for something Ebay finds important enough to email me about almost 5 weeks later. A small text link amongst a crap ton of graphical elements is simply not enough. Ebay should simply highlight better the feedback call to action for closed auction pages similar to how they show “View order details”. 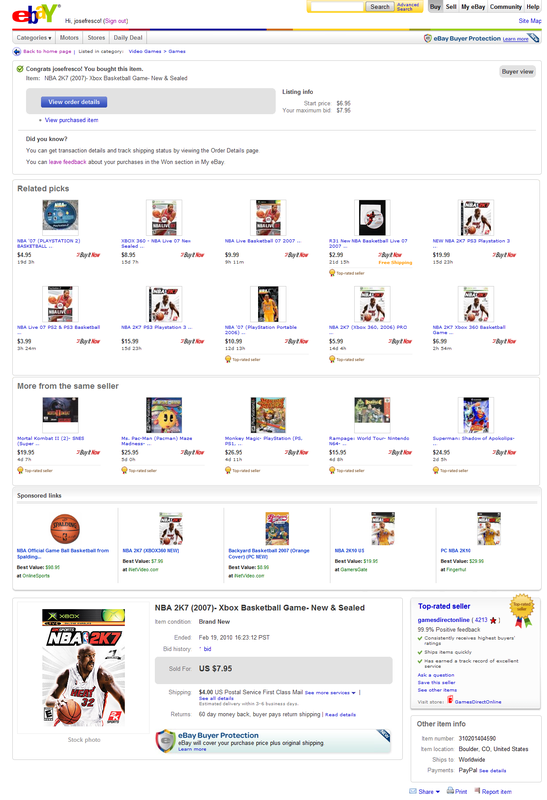 The Game: I wanted to purchase the latest NBA 2K game (2007 was the last year) I could for my classic Xbox and sell the 2003 version I already had as it wouldn’t be needed. The 2K7 version however has modified controls that so far have me completely baffled. Maybe I’m just getting old but besides a small graphics update and some nice new animations I’m not impressed.